Dice is a game for 2 to 4 players where 6 dice are thrown and scores accumulated. The first player to reach 10,000 points is the winner! A great way to pass the time for kids and parents, couples, grandkids and grandparents! There can be 2 to 4 players per game. The first player to reach exactly 10,000 points is the winner. Player 1 always goes first. 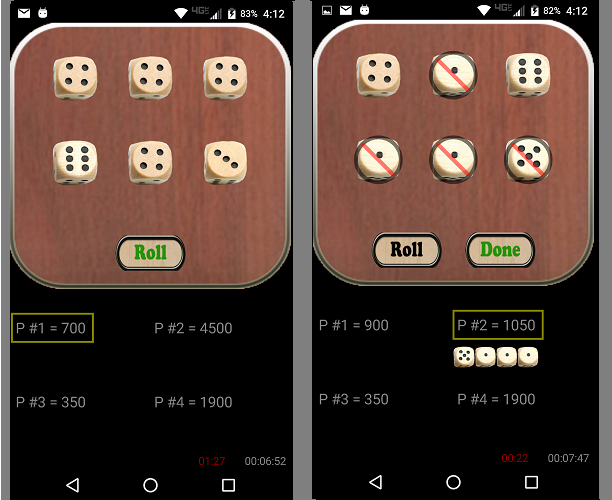 Each player must keep at least one scoring dice per throw and their turn will end if there are no scoring dice after the throw. The player can end their round at any time by pressing the "Done" button and keep all the points scored that round. A yellow box will highlight whose turn it is and the total score for the active player will show at the bottom of the screen and the total points for that round will show by the players score box. Use the volume button to reduce the volume of the sound effects and selecting the "2 Player" button will cycle the number of players for that round. The number of players should be selected before pressing the "New" button. - 6 of any number = automatic win!